Last year on the SS15 Margret Howell campaign we went off to the windy rugged shores of Norfolk, driving like we do early in the early morning with a car full of kitchen equipment and produce, we arrived to a make shift kitchen on the beach. This, for us, is one of the perks of being a Tart- getting out of oppressive studios and the concrete polluted jungle we live in, even if hideously early, to arrive with the sunrise and be in nature making eggs to order for the sleepy crew. Being able to use the outdoors as a kitchen for the day is wonderful, there’s a certain buzz that’s hard to explain, when the weathers good and your chopping away with pots on the boil you feel pretty rock n roll. Looking back our favorite jobs have been when cooking outside or at a location house, where we get to sneak off like giggly school girls mid-morning (once the breakfast rush is over) and explore, the things we have come across... a hot air balloon, a lion and a famous supermodel with flowers coming out of her hoo haa. This Middle Eastern inspired dish was created on this job, making the marinade up the night before and marinating overnight- was a success and one we love doing for our own dinner parties. Inventing a marinade, like a dressing, is where cooking gets creative and rewarding. Thinking of flavors that compliment each other and getting inspired from far off places. This is the perfect dish to serve as the days are getting longer and warmer, its light and healthy and full of harmonious flavours. We like to serve this with an array of colourful sides depending on how many mouths you have to feed all dotted about in different sized bowls down the table creating an interactive feast. Let your guests pile their plates with soft pita breads, spiced yoghurts, smokey-charred babaganoush, garlicky hummus and Kalamalata olives alongside vibrant zesty salads. Writing this conjures up memories of being in Morocco, the heat, the wonderful smells, the buzz in the air and the delicious food that you find unexpectedly on the side of the road. 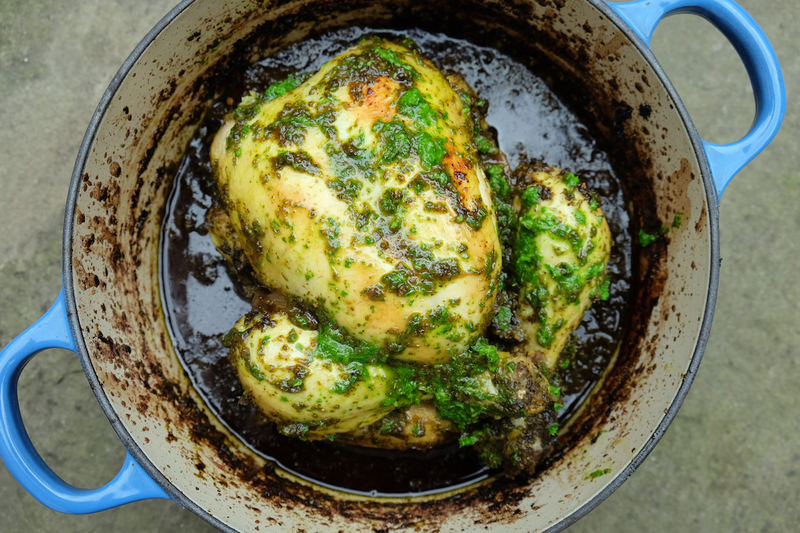 Blitz your marinade ingredients, or very finely chop and mix together in a bowl- then cover your chicken all over and leave to marinade for at least a couple of hours. Preheat oven to 190. Put the chicken in an oven proof pot with the rest of the ingredients, pouring in the wine and water so it covers and then place the lid on. Cook for an hour and then take the lid off and cook for a further 15- 20 mins (making sure the chicken is cooked through). Take the chicken out of the pot to slice and serve up, reserved sauce delicious for your feast.